As part of this year’s london open house weekend[2. It was notable that severndroog castle was missing from this year’s openings, although hopefully before too long it will be open almost every day!
] I visited the officers mess of what was once the home of the royal artillery, Woolwich’s long standing military inhabitants of nearly three centuries. Woolwich has a long military history, which stretches back to the tudor period when weapons were stored here for henry the eighth’s hunting expeditions. Until recently, the royal artillery were an important part of this history, however some time around the beginning of the new century, the army was seeking to capitalise on the sub-prime mortgage boom, and planned to sell off its London properties at bumper prices. Moves were afoot to sell both Woolwich and Chelsea barracks to speculators who were going to turn them into, yes, you’ve guessed it, flats… but then the country found itself at war, and it was decided that it might be worth keeping a few soldiers in the capital after all. By that stage the dizzying prospect of the £900 million (record breaking sale) that could be made by selling Chelsea made it clear that Woolwich would be the last home of the armed forces in London. Unfortunately by the time this about face had been performed, the artillery had already started the process of moving out to their training grounds in Wiltshire, and so that was how hundreds of years of traditional life in woolwich came to an end. Nowadays the garrison plays host to the second battalion of the The Princess of Wales’s Royal Regiment, until they go off on-tour again, at which point another section of the army will move in, and things will probably continue in this way for a while. Interestingly the current inhabitants have extended the front parade and added a fence, which has had the pleasant side effect of a public footpath being opened alongside which runs parallel with the front of the garrison, making it possible to walk the full length of the allegedly longest georgian façade in europe! If you do venture that way, please remember to stick to the path, or you might find yourself looking down the wrong end of a gun. The visit itself was by guided tour, and took in the front parade, the silver collection, various meeting rooms and display pieces, including some tigers and tusks, a table on which the peace treaty of Italy in ww2 was signed, and we wound up in the chandelier festooned dining hall, while I was there i saw a small group of soldiers tucking into some cornflakes, but it’s clear that this place was built with royal dinner guests in mind! I would wholeheartedly recommend this tour to anyone that might be interested in going next year. Grade II* listed (1776-1802), commissioned by the then Board of Ordnance. Front Parade, at 1080ft, is said to be the longest Georgian frontage in Europe. Comprises both the Officers’ and WOs’ and Sgts’ Messes of the Barracks, linked in centre by magnificent South Arch. Officers’ Mess, opened in 1802, was the first communal Mess to be used by the Army. There will be a Nearly New Sale at Christ Church Hall, on Shooters Hill Road between 12pm – 2pm on the 25th September. Tables are only £5, they need to be booked in advance with Vicki Hall victoriahall23@googlemail.com as there are limited spaces. Admission for buyers is 20p per adult. Home made cakes, teas and coffees will also be available, as will the new Christmas card range from Phoenix Trading. This is from the well hall pleasaunce fun day last sunday, ok ok it’s not on shooters hill, but the pleasaunce is a nice place to visit locally (apart from the so-called ‘relief’ road[1. Relief roads often turn out to provide little relief in the long run, although i did read somewhere that the rochester relief road had the completely unanticipated effect of reducing traffic trouble on shooters hill, although it’s obvious a new tube station would have given more relief than that brutalist monstrosity]), what with the newly refurbished tudor barn, and the most romantic (ex-)cinema around. We join the story at the point where a policeman arrives to take mr punch to be hung for beating up his wife and child, only to get a beating himself. Luckily joey the clown arrives in time to save the day, following a bizarre interlude where the bexley basher and the woolwich walloper have a quick boxing match. The show was performed by award winning professor john styles, one of the grandest of them all. He introduced the show by explaining that mr punch hits people, and that anyone of a politically correct disposition might be advised to ‘clear off’ (twirl of the hand), which is curious because a lot of professors handle the domestic violence aspect of the show a bit differently; the guy at the plumstead make merry for example, who pulls of the tricky feat of modernising the show whilst keeping the tradition alive. The problems about violence were pointed out in advance, and the audience were invited to challenge punch’s behaviour. Also, it does have a happy end, mainly thanks to the crocodile, who eats mr punch’s stick, and nearly finishes off mr punch too, who then, having been resuscitated by joey the clown, realises the error of his ways and promises to turn over a new leaf. This would have been better as a video as it includes lots of visual jokes, there’s the odd decent one on youtube, such as the weymouth beach version. The idea of setting up a new free school in the area has just been announced in a local leaflet in which potentially interested parents of (near) school age children are invited to complete a questionnaire on their website. It seems that this whole enterprise is very much in the early stages and it’s difficult to know exactly what’s going on, but if it does manage to open in September 2011, it will be the first free school to be set up by a plc (skyeward) rather than parents (hampstead and dearne). The news section of the website reports that premises have been found at adair house (opposite the old herbert hospital), and the company “… have gained a better understanding of the needs in se18, greenwich”. Currently the school is being marketed, measuring potential numbers of children, dates of birth, and postcodes as part of the campaign to start the school – they are also looking for parental support in this regard. The curriculum appears a little odd as it runs to 5pm on weekdays, so presumably it will be a fee paying school, with some tax funding on the side. It will certainly be interesting to see how this pans out; could it be that Shooters Hill becomes a test case for the future privatisation of education? Judging by the relatively large amount of visitors this website receives via its post on the falconwood model railway[1. Welling and district model engineering society], it seems that there is much enthusiasm for steam trains in these parts, and so it gives great pleasure to announce[2. Thanks to 853, ianvisits, and event sponsors sheperd-neame, the journey itself is being run as part of a two day hop festival in faversham this weekend.] 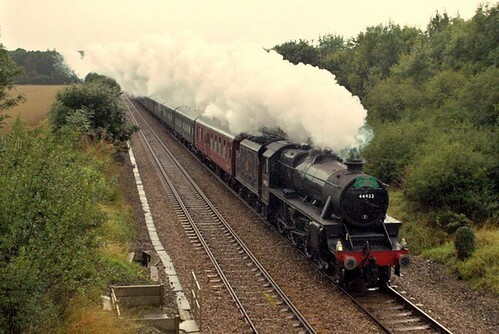 that this train will most likely be passing through falconwood on it’s way to kent having left london bridge at 0955 on sunday september the 5th and due to arrive at faversham at 1145. The train is expected back at london bridge at 2000, but it’s coming back a different way. I say most likely going through falconwood station as the journey is advertised as passing bexleyheath, which is on the same tfl line as our station, whether or or not the same goes for special services I’m not sure. As a provisional guestimate, and pending the actual departure times, I would reckon that the train might come through the falconwood at around 1015-1100.